Viknesh Vijayenthiran March 20, 2018 Comment Now! 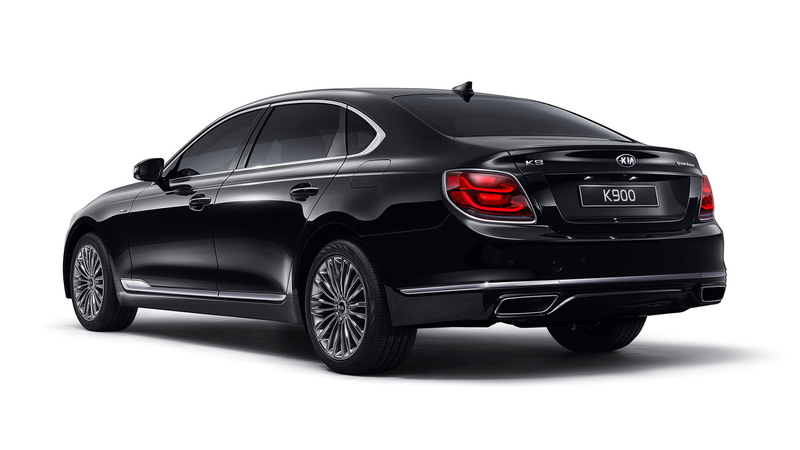 Kia on Tuesday released the first details for its redesigned K900 flagship sedan, which makes its world debut at next week's 2018 New York International Auto Show. Included was a handful of photos that hint at an elegant, almost minimalist-like design for the new K900, which in some markets will be known as the K9. The interior is particularly inviting thanks to its stitched leather lining the top of the dash, which is separated from the lower portion by a strip of real wood trim. We're told that most of the controls are also formed from real metal. One of these is a rotary dial controller on the center console. The design also integrates a pair of 12.3-inch digital screens, one serving as the main instrument cluster and the other as the infotainment hub. A special touch is the use of proximity sensors to only illuminate those controls that the driver or a passenger is attempting to reach. A Maurice Lacroix analog clock is also placed between the center air vents. The exterior appears to match the elegance of the interior. The grille features 176 individual cells forming its mesh pattern, and from here graceful lines stretch back over a long hood and sweep through to the rear flanks, culminating at a clear rear. Both the head and taillights feature a twin-bar graphic that Kia refers to as a Duplex Comet motif. Note, the version of the car shown is for the Korean market. Hopefully our version will lose the tacky chrome surrounds for the taillights. The new K900 is longer and wider than the model it replaces. The wheelbase is up 2.3 inches to a new total 122.2 inches, while both the front and rear overhangs are shorter, pushing the wheels further out to the corners of the car. The platform should be the same found under the Genesis G90, and the powertrains should be shared with the Genesis as well, meaning a 365-horsepower 3.3-liter twin-turbo V-6 in base trim and a 420-hp 5.0-liter V-8 in range-topping trim. 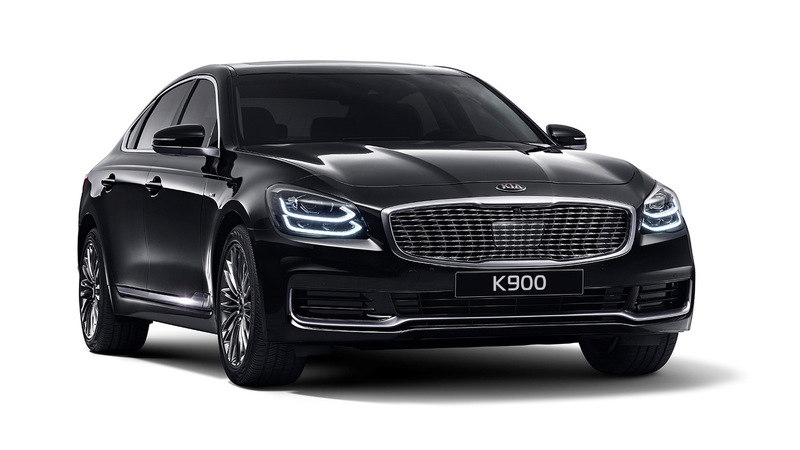 While the current K900 only reached the United States for the 2015 model year, the car has been on sale overseas since 2012, which is why it's being redesigned now. 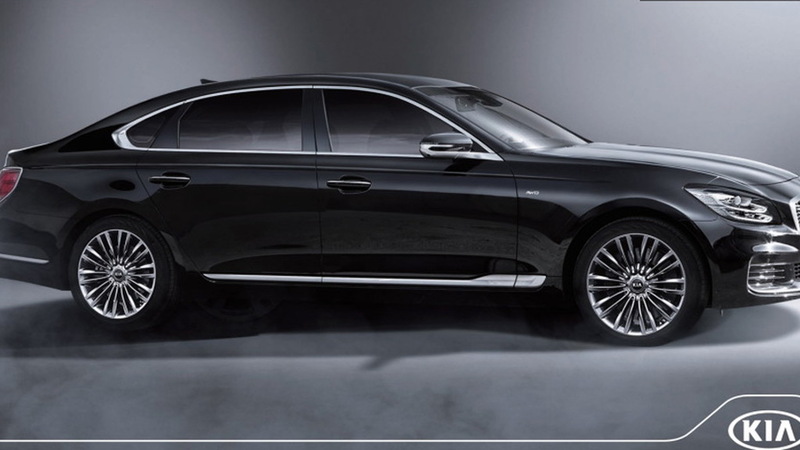 Expect the new K900 to start slightly above the current model's $50k sticker. We'll have all the details soon as the N.Y. auto show starts March 28. To learn about other vehicles appearing at the show, head to our dedicated hub.